Directions: On this worksheet you will practice properties pertaining to horizontally released projectiles. 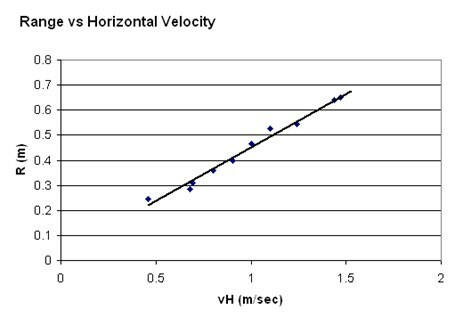 Remember to use an H|V chart to organize your data. Question 1 A ball is released horizontally at a speed of 9 m/sec from the top of a cliff of height 16 meters tall. How many seconds will be required for the ball to land on the beach at the base of the cliff? Question 2 How far from the base of the cliff will the ball impact? Question 3 What is the magnitude of the ball's resultant impact velocity? Question 4 At what angle will the ball impact at the base of the cliff? Question 7 In the lab 'Range of a Projectile' a group obtained the following graph. Based on the graph's equation, y = 0.423x + 0.016, how high was their table?